There is something that is really big these days online called Facebook. Your brother Jack just got started tonight. I know this might sound strange, but he is now Facebook "friends" with your friends. Jack also became friends with cousins Michael, Hannah and Emma. He is "chatting" right now with Sam Shoyer. 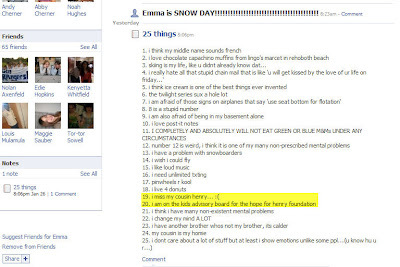 Here is something that Emma posted yesterday. It appears you're on Facebook too. I haven't written in a while. There is a lot going on. As I always say, "just 'cause I haven't written doesn't mean I'm not thinking of you." We had a vacation and an Inaugural since I last wrote you. I'll get you caught up soon. Sorry. How terrible/crazy is it to see these both in the newspaper on the same day. Actually, the same thing happened before. I will look back and find that. Unfortunately, we know that whole ventilator/University of Minnesota thing. Let's hope for a good outcome. GASTON – When Dylan Moore and his family return from Minnesota where he is receiving treatments for the rare disease, Fanconi anemia, they are in for a big surprise thanks to a few special people and the Roanoke Valley Home Builders Association. Since the progression of his disease has severely weakened his immune system, Dylan, who has always had to share a bedroom, will need his own separate room and modifications made throughout the home, said Joey Elias, president of the builders group. The main problem was the Moore’s home just wasn’t big enough to create a separate special area for Dylan. There was, however, a nice carport attached to the brick home. It doesn’t take much imagination to guess what the group of builders decided to do with that carport, but most would think one simple bedroom. What the group has done is transform the carport into a bedroom suite, complete with its own bathroom and closets. The suite is attached to Dylan’s parents’ bedroom through their bathroom, with a separate laundry area and hallway entrance that now exits into a new bricked-in carport. Elias said Mike Copeland did the framing, Rightmeyer Equipment Rentals provided all the landscaping and heavy equipment used and most of the concrete work. Lloyd’s Decorating Center donated the paint supplies and will help with the flooring. Weaver Insulation donated all of the insulation and Bill Freeman Roofing donated all the labor to seamlessly blend the new roof in with the existing one. “Once again, I feel badly because I know I’m leaving out so many people who have been involved in Project Dylan,” Elias said. There is one big push going on now to finish the project because the Moores are expected to return home by the end of January. Elias and the guys working Friday were a whirlwind of activity. Once they are out of the way, the final painting will start and the flooring will be installed. The finishing touches will be the landscaping, which John Pittman Landscaping will handle. What the Moores see when they get home will surely amaze them. With Dylan’s special needs, this group of builders has made life much easier for the Moores. Elias said it is just another example of how caring people are here in the Valley. “When we heard about the family in need, we all just came together and got it done. The one’s who called us are the one’s that deserve the credit, but that’s just the kind of people they are,” said Elias. FAIRVIEW, MINN. — The family of Dylan Moore is asking for prayers as a new mass was found behind his heart this week and he is now in intensive care, once more on a ventilator. The 8-year-old child was reportedly scheduled to leave the University of Minnesota Children’s Hospital in seven days, and the family had been counting down until the time when they could all be reunited. 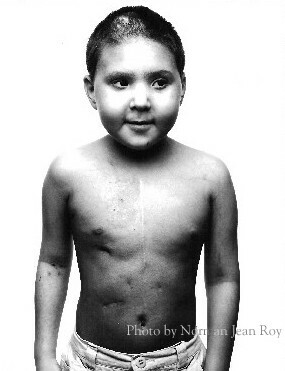 Moore was born with Fanconi anemia, a rare genetic disease, distinguished by short stature, skeletal anomalies, increased incidence of solid tumors and leukemias, bone marrow failure and cellular sensitivity to DNA damaging agents such as mitomycin C. He recently underwent a bone marrow transplant. Hen, this is how our world went from perfect to topsy turvy. The only thing you don't hear in this video is the sound of the timebomb starting to tick. Nana unearthed this video when we were out in St. Michaels for New Years. It was your Yahrzeit, the 6th of Tevet. This was incredibly hard for me and Mom to watch. It was the first time we'd ever seen it. All of a sudden the future goes from innocent and bright to dark and scary. Welcome to the world beautiful Henry from Allen Goldberg on Vimeo. Well, at least I knew you were going to be a girl. I don't remember that Mom thought you'd be a girl. Way to prove 'em wrong, boyo! ROANOKE RAPIDS— After two months, Dylan Moore is starting to show progress in his recovery from a bone marrow transplant he received in October. 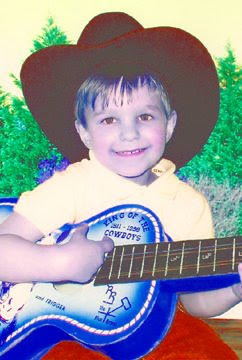 Moore, a 7-year-old who has stolen the hearts of all who know him, suffers from a rare form of anemia, Fanconi anemia. Family and friends have rallied to support the family, and several fundraisers sponsored by the Eagles Club and many others were held to provide for the family during Moore’s lengthy illness. Moore suffered from kidney failure early on after the procedure and had to endure dialysis daily. He recently developed an infection, similar to mono, and was put on a respirator. High fevers and unanswered questions plagued the family as everyone held their breath and prayed for a miracle. 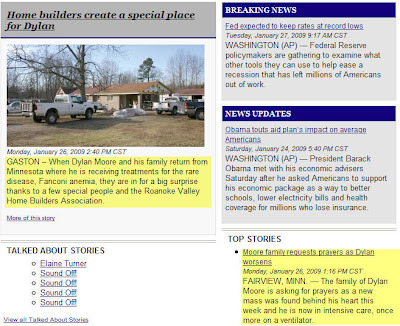 Moore was finally removed from the respirator about a week before Christmas. Worry still prevailed however, as his kidneys still refused to function. Early Christmas Eve morning, prayers were answered as Moore’s kidneys functioned for the first time since his surgery. “It was only a little and it was the color of coffee … This is a very good sign that his kidneys are trying to work some!!! !” wrote his mother, Betsy. She went on to say that he is still having trouble with the dialysis, his blood pressure jumps all over the place, his heart rate slows to unthinkable levels, and doctors don’t understand why he has such sever reactions. Perhaps the new developments in his recovery will negate his need for dialysis soon. In the meantime some of his family has come in and he will be able to see them for Christmas.